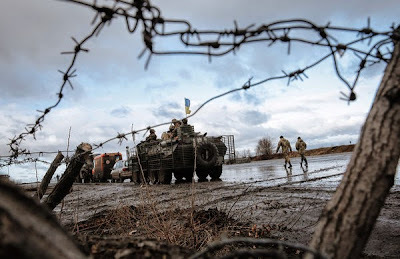 KIEV, Ukraine -- At an army checkpoint near the occupied city of Donetsk in eastern Ukraine, Lt. Col. Natalia Semeniuk approached a convoy of two minibuses that had just arrived from Kiev. Slung over her shoulder was an AK-47 assault rifle. Clumps of long, brown hair poked out from beneath the beanie she wore to guard against the cold, which had dropped to about minus-20 degrees Fahrenheit. Colonel Semeniuk was meeting with Anna Sandalova, a former public relations executive and a founder of Help the Army of Ukraine, a foundation that uses Facebook to raise money to buy equipment for Ukraine’s desperately underfunded army. Ms. Sandalova has become something of a star in her country, especially to its soldiers. She supplies them with everything from body armor to night-vision goggles, to sleeping bags and food. Since her group was established in March, it has raised over $1.3 million, Ms. Sandalova told me, for the fight against the pro-Russian separatists who have occupied large parts of eastern Ukraine. An overwhelming majority of the money is crowdfunded from the Ukrainian people through Facebook. The process is simple: Ms. Sandalova liaises with army divisions fighting in the field. They tell her what they need and she posts their requests to Facebook. People donate via bank transfer into the foundation’s account, and Ms. Sandalova and her colleagues then drive the goods to eastern Ukraine personally. That day, the minibuses were filled to bursting. Clad in body armor and a helmet, Ms. Sandalova followed Colonel Semeniuk to a Ukrainian Army camp in the forest near Donetsk to make her first delivery. Canvas tents dotted the area, erected among thickets of trees covered with snow. Soldiers huddled together, talking and smoking. Some helped unload several mobile shower units. Dozens of these volunteer groups have sprung up as the fighting has intensified. “It’s all about networks,” Ms. Sandalova explained. Ms. Sandalova makes deliveries to soldiers in various divisions throughout the war zone and the reaction is always the same: delight. She has a policy of kissing soldiers who are single. At a camp near the front lines, a soldier in his early 20s went bright red when Ms. Sandalova kissed him roundly on the cheek to roars of approval from his comrades. After two days, the minibuses were empty. Ms. Sandalova is modest about her role. “It’s the power of social media,” she said simply. Ask a Ukrainian where to find the most reliable source of military news and most likely they’ll point you not to the Ministry of Defense website but to “Information Resistance,” a widely read analytical review, also on Facebook. Want to know what contracts the government is taking bids on? The Euromaidan revolution that overthrew President Viktor F. Yanukovych in February galvanized Ukraine’s people. It showed them what they could do. Civil society, not government, now leads the way, especially when it combines with social media, which is tailor-made for the post-Soviet space, where institutions have atrophied from years of Communist rule. All you need is a laptop and a Facebook account, and you can take action. Crucially, everything Ms. Sandalova does is quick. Using official government channels requires various permissions, which often takes time that simply isn’t available when people are at war. “We are not a government department facing endless bureaucracy,” she said. And stultifying bureaucracy is the least of the government’s problems. The catalyst for the Euromaidan revolution may have been Yanukovych’s failure to sign the European Union association agreement, but its root cause was popular disgust at two decades of ubiquitous corruption. It is hard to overestimate the scale of the problem. In its 2013 Corruption Perceptions Index, the independent research organization Transparency International ranked Ukraine 144th, tied with the Central African Republic and below Kazakhstan. Nowhere is corruption more prevalent than in the military. The Ukrainian Army is the state in miniature. It emerged, like the country, from the Soviet Union in 1991 — huge, but bloated and rotting inside. Corruption has stymied progress since independence. According to the English-language Ukrainian newspaper The Kyiv Post, Ukraine’s military budget for 2014 was about 3.4 percent of gross domestic product, and much disappears into the pockets of corrupt officials. Promotion through the ranks is dependent not on ability but on bribery; soldiers are trained not in the art of war, but of theft. Parts, weapons, even uniforms are all up for sale. Much of this money will be stolen, even more wasted. The international strategy is wrong. Ukrainian civil society in all its forms is increasingly doing what the state cannot. Where the state fails to deliver, the people make up the difference; where it is slow and flabby, they are quick and lean. The United States and the European Union should set aside greater aid, funding and expertise that bypasses Ukraine’s sclerotic and corrupt government and goes directly to the country’s major civil society groups. Ukraine is fighting a war in which 21st-century means have emerged that often enable networks of citizens, empowered by social media, to outperform the state. To defeat the separatists, fund Ukraine’s people, not just its government.